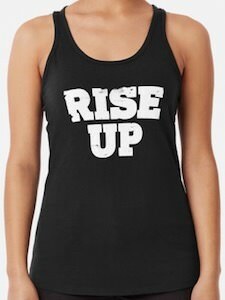 Now you can get your own Rise Up Tank Top. This women’s tank top is made from 100% cotton and comes in women’s sizes XSmall – Large and in a black and a white version and if you like a t-shirt then you are in luck as you can get this design on shirts for both men and women too. On the tank top, it says “Rise Up” and that could mean you like to make a statement that we should rise up and change the world or simply that you want to stand out at the gym. It is a fun shirt that will look great on you. 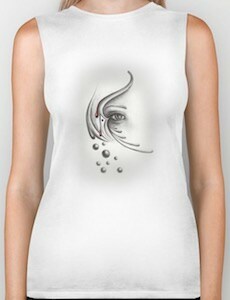 Now there is cool shirt with any eye and you just have to check out this look at the eye tank top. The shirt shows an eye and surrounded the eye you can find some interesting shapes and even some circles and you will be wondering if they are tears. It really looks amazing as it kind of looks like a face but they eye just stands out. The eye tank top is unisex so it will be just perfect for men and women and is available as a t-shirt too and it comes in sizes XSmall – XL and is made from 100% jersey cotton. Now there is cool tank top with a tie dye print and one that shows the yin yang symbol. 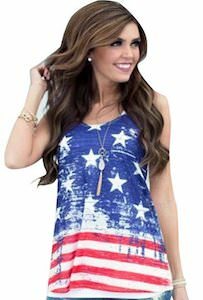 The women’s tank top has spaghetti straps and is white on the top and purple in the middle going down where it has green that covers a big part of the side too. The fun tie dye pattern can be found on the front and the back. On the front on top of the tie dye you can see the black and white yin yang symbol and the black is dripping like wet paint which add to the fun design of the top. And you can get this yin yang tank top in women’s junior sizes XSmall – 2XL. 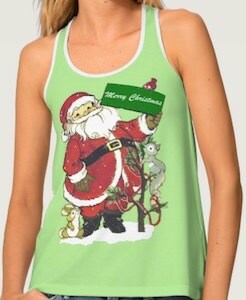 If you like a fun shirt for the holidays then you should check out this Merry Christmas Santa tank top. The green tank top has a relaxed fit and comes in women’s sizes Small – XL. On the shirt, you can see Santa Claus and he is holding up a green sign that says “Merry Christmas” while some animals are looking at him. There is even some snow. A shirt like this is great if you love the holidays because nothing is better then having a fun Christmas t-shirt like this one. 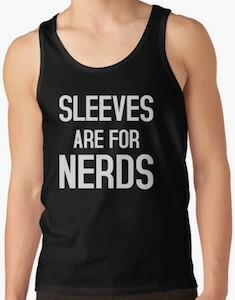 If you want a fun tank top for summer then check out this Nomad Rising Tank Top that is made by O’neil. 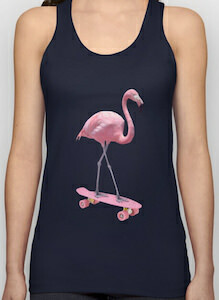 The women’s tank top is black and has a racer back to make you shoulder enjoy the sun. On the front of the shirt, you can see the sun rising and you can see it is rising over the desert and below the sunrise, it says in big letters “Nomad Rising”. 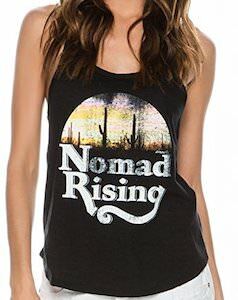 If you are the nomad kind and like to see the sun rise over the desert then start by wearing this tank top so that the world knows what you like to see in life. 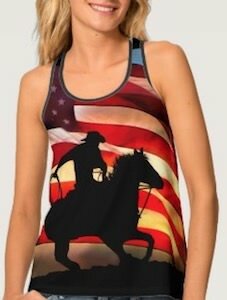 You can get this women’s tank top in sizes Small, Medium, and Large and the top is made from 50% cotton and 50% polyester.